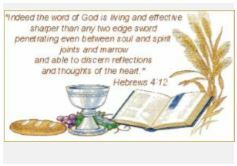 This ministry is dedicated to God’s living word as proclaimed by the lector. One way to proclaim His Word in Scripture is through the use of structured verse speaking - simple in concept and dynamic in application. By building the reading line by line from the beginning and maintaining a flow of thought to the end, the life contained within a scriptural reading (or any liturgical proclamation) can be enhanced by the lector applying the elements or tools of this structural format. Sacred Scripture, then, becomes a form of spoken music (powerful or gentle - always respectful) whereby the printed word is lifted off the page and proclaimed as a living, dynamic and timeless form of praise to glorify and celebrate the Word of the Lord.